Someone once asked me to post what hairstyles my 12-year old comes up with. 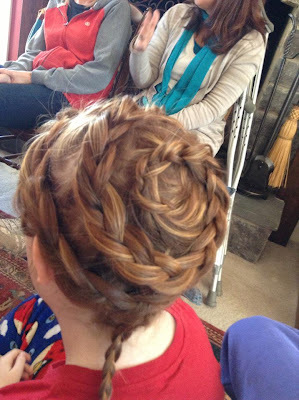 She was at a Young Women's Autumn retreat and from the brief explanation I received before she ran off again was that they spent a fair amount of time doing hair. She did this one on one of her besties. She started in the middle and went from there. Not to shabby.